Here's where to watch every episode of Home Town season 1. Mouseover or tap an episode to see where to stream it. Click or tap the play icon to stream it on the best available service. 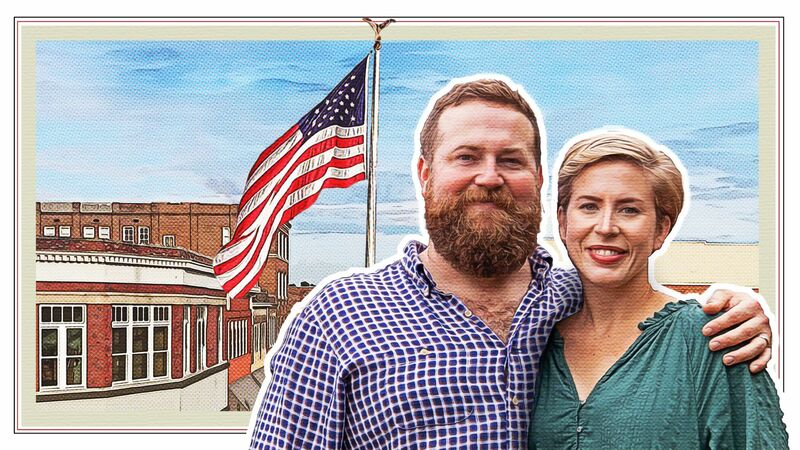 Big Renovation in a Small Town Jan 24, 2016 Ben and Erin Napier love their small town in Mississippi. They're passionate about making their town flourish like it did years ago. The best way they know how is to make it a friendly and welcoming place to live. Ben and Erin help new people moving to town find a house and renovate it into their dream home complete with southern charm. A Town to Call Home Mar 21, 2017 Kristen dreams of watching her kids grow up in a small town like she did, but as a military family, they are always on the move. Now that husband Kelvin is close to retirement, they've decided to settle down so their young children have a place to call home. Kelvin and Kristen's all-in budget is $250,000, so Ben and Erin show the couple two family-friendly homes: a big, old charmer that's a lot of house, and a character-rich Craftsman with a lower price but a longer "to do" list. Ben and Erin create the ultimate family home including a study area, play space and stunning new kitchen with a unique bowling alley countertop. Homecoming Mar 28, 2017 Kyle and Brooke want their "someday children" to grow up in a small town like they did, so they're leaving Nashville and heading back to their childhood hometown in Mississippi. They want a house with history and room to grow. Ben and Erin show the couple two Craftsman homes: a character-rich cottage in need of an update, and a quirky but roomy home with a cramped kitchen. Both houses come at a similar price, leaving Kyle and Brooke to decide where their all-in, $200,000 budget will go the furthest. History in the Making Apr 4, 2017 After moving to New York City to pursue his architect career, Bill is ready to settle down with his fiance Jody in the small town he's loved since childhood. Ben and Erin show the couple two very different homes -- a dilapidated historic house with character that requires a ton of work, and a Craftsman that needs updates and a personality. With an all-in budget of $200,000, Ben and Erin transform the couple's pick into a dream home with a gorgeous kitchen and custom millwork. A House With History Apr 11, 2017 Will, Courtney and their boys have outgrown their starter home, so they enlist Ben and Erin to help them find their forever house. On their wish list is a sizeable, historic house that's rich in character and small town charm. Ben and Erin show the couple two homes: a large house that is short on personality, and a smaller house with loads of character but a long list of necessary repairs. With an all-in budget of $200,000, Will and Courtney have to weigh out what matters most. Cottage Charm Apr 18, 2017 Empty nesters who are moving to town to be close to their children and grandchildren want to downsize into a historic cottage with an all-in budget of $125,000. Ben and Erin show the couple two options: a small, dated house with exterior charm and a home that makes up for its lack of character with an attractive asking price. Porch Dreams Apr 25, 2017 Amanda is returning to Mississippi after seven years of living in San Antonio, Texas, and she's looking for a historic home with a front porch and room for entertaining for $150,000. Ben and Erin show her two homes and after Amanda makes her pick, they create a dream space dripping with Southern charm and a to-die-for kitchen. Military Family Finds Small Town Charm in Mississippi May 2, 2017 A well-traveled serviceman and his wife settle down after finding a job in small town Mississippi. Ben and Erin have been given an all-in budget and are tasked with satisfying the couple's wish list that includes a historic home with a chef's kitchen. They come back with two choices: a cozy Cape Cod-style house with a small kitchen and a charmless exterior or a slightly larger home with interesting architectural details and a welcoming front porch. Ben and Erin make the couple's dreams come true by creating a home dripping in charm that includes a French provincial, chef's kitchen and a handcrafted work table. Small Town Life for a Growing Family May 9, 2017 A Chicago woman moves her family from the big city to a small town in Mississippi. She's looking for a family-friendly house for her kids and future grandchild with room to entertain and a private oasis for herself. With a comfortable budget, Ben and Erin show her two homes: one with an unwelcoming exterior and an interior that's a bit dated, and another home that's smaller with very little character. Despite the limitations, Ben and Erin overcome their obstacles and wow the family with the home of their dreams. So Long Loft, Hello Home May 16, 2017 A family of four has outgrown their loft and is ready to use their all-in budget of $200,000 to move into an family home with a yard. Ben and Erin show the parents two family-friendly houses -- a dated, boxy home with 14 acres of property and a split-level ranch with a problem layout. Ben and Erin then transform the family's pick into the ultimate home with an open concept and outdoor space complete with an arbor. Country Singer Moves from the Big City to a Small Town May 23, 2017 After living in Nashville for the last 15 years, this country music singer is looking to put down roots in small town Mississippi. She has set her budget and has provided Ben and Erin with a wish list that includes a historic home with a space for entertaining and a spa-like master bath. She's presented with two homes: a classic craftsman bungalow with a large but rough backyard and a large dated house with no kitchen. Ben and Erin deliver a stunning home that includes a manicured outdoor entertainment space and a luxury spa master bath.